I can ALWAYS find time to listen to music, I love it, an iPod/iPad will never be far away and Spotify is one of my most used apps. One of the biggest joys of technology for me is definitely being able to discover new music – weekly! I’m a paid up Premium member of Spotify so my wide and varied playlists travel with me. Music can change my mood, my whole perspective in a very short time. Honestly, if you asked me to define my taste in music I would stare at you blankly. I’m not sure that is possible. Ummmmmmmmmmm? I guess ‘eclectic’ will have to be the word we use. I was going through my old CD collection the other day (old school right?!) and laughing at the different stages in my life represented by the different types of music. These days I still listen to some of the music from my 20’s although a lot of it is pretty rough and when I listen to the lyrics, it’s no wonder I spent so much time under a cloud – they are not exactly uplifting. That makes me a little sad but I can’t change what’s been and gone. I have always loved Musicals and Popera, there’s a bit of country music creeping into my repertoire these days, a genuine singer-songwriter can easily hook me, but mostly I lean towards contemporary Christian music. That said, I could be watching a movie and hear a good tune, so I jump on Spotify and suddenly there’s a new artist for me to download (it drives my husband crazy when I literally pick up the iPad mid-movie and start searching away!). Sound recordings and lyrics for this album are on the Crowder Website. 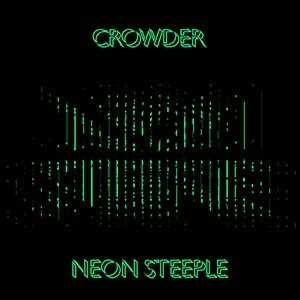 My latest favourite (I do have a ton of ‘favourites’) is not a new artist discovery but an old friend, Crowder, with their new album Neon Steeple. There are songs that are toe tapping good and others that make you want to crawl into the song to experience the grace and peace it speaks of. I know I will look back in years to come and this album will remind me of the story of this stage of my life: A learning, healing, growing journey. It’s an exciting time, peppered with some awfully hard moments, but some real beauty in the discovery, and the more I lean into the love of my Lord, the better it gets. “Neon Steeple is a collection of songs and sounds looking forward to the past and counting the present as sacred. It is a longing for belonging, a search for home. It is a collection of choruses that believe that this is not all there is. There is more, there must be. It is the sound of the Appalachians and Ibiza. Folk music and EDM. The music of the People. Folktronica. Digital and Analog”. I am excited about life at the moment, I know there is great stuff coming. This album reflects that – it helps lay to rest some burdens while being hopeful about the future. I need this sort of music in my life, I take lyrics to heart and need them to be uplifting. Does music affect you in the same way? What are the songs you listen to, to get you out of a funk and moving again? I’d love to know! Oooh you have some GREAT songs in there! I remember buying the Soul Asylum CD just for Runaway Train and you can’t go wrong with some GNR.